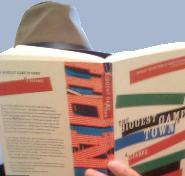 I’ve written here many times about the English writer Al Alvarez, in particular regarding his 1983 book The Biggest Game in Town. Just click that “Al Alvarez” tag at the bottom of this post to see a number of examples. Alvarez is not just a “poker writer,” of course, having had a lengthy career writing poetry, literary criticism, and other nonfiction on a host of different topics. However, his contributions to our little subgenre of nonfiction or sports journalism or whatever you want to call it are especially noteworthy. Inspiring, even. In The Biggest Game in Town, Alvarez reports from the 1981 World Series of Poker (won by Stu Ungar), ultimately providing an especially insightful, thorough portrait not just of the WSOP and Vegas but American culture as a whole and poker’s significant status within it. 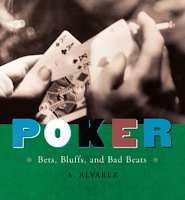 Years later Alvarez penned a second book about poker titled Poker: Bets, Bluffs, and Bad Beats (first published in 2001). At first glance that book’s extensive (and very cool) collection of illustrations and photographs might cause one to consider it a “coffee table book,” but it, too, includes a number of smart, entertaining, and revealing discussions about our favorite card game. The book provides a nice supplement to The Biggest Game in Town, exploring various facets of the game and culminating with a chapter recounting Alvarez’ own participation in the 1994 WSOP Main Event. 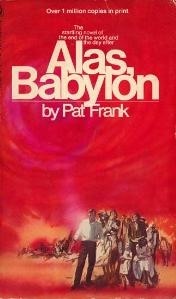 For my “Community Cards” column this week on the Epic Poker blog, I shared some of what Alvarez talks about in that first chapter of Poker: Bets, Bluffs, and Bad Beats as well as in the initial chapter of The Biggest Game in Town. 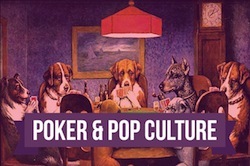 Obviously there was a lot more to be said about the two books and Alvarez’ significant contributions to poker writing, but in the column I mainly focused on some of the Londoner’s observations about poker and American culture. Check out the column for more, and as I say at the end, if you aren’t familiar with Alvarez’ poker writings, you could do a lot worse than to pick up The Biggest Game in Town, Poker: Bets, Bluffs, and Bad Beats, or both.